While different types of needles have different attributes, material choice really comes down to personal preference. In order to find the right needle for you, you will need to try out each type and decide what you like. However, here are a few general guidelines for commonly used knitting needles. Wooden needles have become the standard in the knitting world, with bamboo needles firmly holding the place for the most popular needle type. Wood needles can be made of any hardwood and offer knitters an even knitting speed, a smooth finish and a warmth and softness to the touch that metal and acrylic needles lack. Wooden needles are generally the most expensive style. Bamboo needles offer a cheaper alternative to traditional wood needles with the same warmth and softness that wooden needles offer. Metal knitting needles are most often crafted out of aluminum but can also be made from brass or nickel. Metal needles are more durable than their wood or plastic counterpart and offer knitters faster speeds while knitting and the smoothest surfaces. Metal needles are particularly useful with yarns that tend to catch and can make knitting with them a smoother, less frustrating experience. Metal needles also provide the classic "clicking" sound while being used. Some people enjoy the sound of knitting needles at work while others dislike the sound and opt for quieter options. Plastic needles are the least expensive type of knitting needle and may be a good choice for someone who is interested in trying knitting out for the first time. They offer smoothness comparable to wooden needles and are the lightest in weight. Plastic needles come in extended sizes and are therefore the best choice when very large stitches are called for. They are also often used when knitting alternative materials such as shredded plastic bags, lengths of rags for rag rugs and rope. 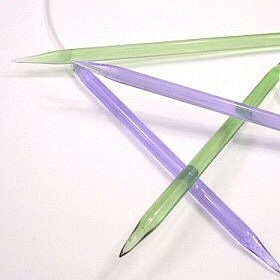 Knitting needles can also be made of poured resin or glass. Both options offer a smooth, dense needle for knitters but are harder to find and less commonly used.